Michael Chiarello (born January 26, 1962) is an American celebrity chef specializing in Italian-influenced California cuisine. He hosts the cooking show, Easy Entertaining with Michael Chiarello, on the Food Network and hosts NapaStyle on the Fine Living Network. Chiarello owns a winery, Chiarello Family Vineyards, Bottega Ristorante and NapaStyle, a purveyor of food, cookware, and furniture in Yountville, and was a competitor on the fourth season of The Next Iron Chef, where he placed as the second runner up. In spring 2013, Michael opened Coqueta, a tapas restaurant on San Francisco's waterfront. Born to an Italian-American family, Chiarello rose to prominence at a young age. After graduating from the Culinary Institute of America in 1982, he studied hospitality management at Florida International University, receiving his Bachelor's degree in 1984. The next year, he opened The Grand Bay Hotel in Coconut Grove, Florida, and Toby's Bar and Grill. He was honored as 1985's Chef of the Year by Food & Wine Magazine. Later in the 1980s, Chiarello moved back to his home state of California, making his home in the Napa Valley. One of his first endeavors was chef at The Heritage Restaurant in Turlock which failed and went bankrupt. He opened the Tra Vigne restaurant, creating a menu influenced by the cuisine of his family's native Calabria and rife with local seasonal ingredients. He has since served as executive chef in numerous American restaurants including Caffe Museo in San Francisco, Ajax Tavern and Bump's in Aspen, Colorado, and Bistecca in Scottsdale, Arizona. His first cooking show, Season by Season, debuted on PBS in 2001. He hosted two more series for PBS, Michael Chiarello's Napa and Michael Chiarello's Napa: Casual Cooking over the next two years before moving to the Food Network to host Easy Entertaining in 2003. In 2004, Chiarello's latest show, NapaStyle, premiered on the Food Network's sister network Fine Living Network. 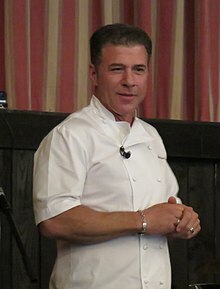 Chiarello was included as a contestant on Top Chef Masters, winning his preliminary round and advancing to the championship round, placing second to Rick Bayless (first place). Reruns of Easy Entertaining now appear on Food Network's sister network Cooking Channel. In 2011, Chiarello appeared in the Visit California promotional film aimed at boosting tourism from the UK. Chiarello has been married since 2003 to his wife Eileen, with whom he has one son, Aidan, born in 2005. He has three daughters, Margaux, Felicia, and Giana from his previous marriage. In November 2016, Chiarello was arrested for driving under the influence and for possession of a controlled substance in Napa, California. ^ Lucchesi, Paolo. "Star Food Network chef Michael Chiarello arrested in Napa on DUI". SFGate. San Francisco Chronicle. Retrieved 3 November 2016. "Michael's Bio". NapaStyle. Retrieved August 17, 2009. "Michael on TV". NapaStyle. Retrieved August 17, 2009. "Michael Chiarello: Bio". Food Network. Retrieved August 17, 2009. "". Cooking Channel. Retrieved December 19, 2010. This page was last edited on 1 June 2018, at 13:58 (UTC).